Bryan Hulbert - WHEATLAND, Mo. 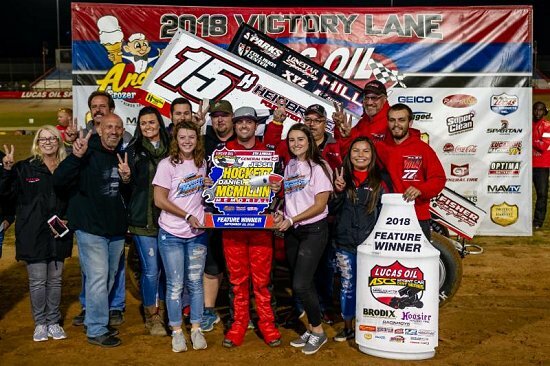 (September 22, 2018) Winning for the second year in a row, Sam Hafertepe, Jr. dominated the 30-lap, $10,000 to win finale to the 8th annual Hockett/McMillin Memorial with the Lucas Oil American Sprint Car Series presented by Sawblade.com. "Just unbelievable, we haven't won a big race all year long and we were really missing it last night and I just told my guys, we're thinking too hard. 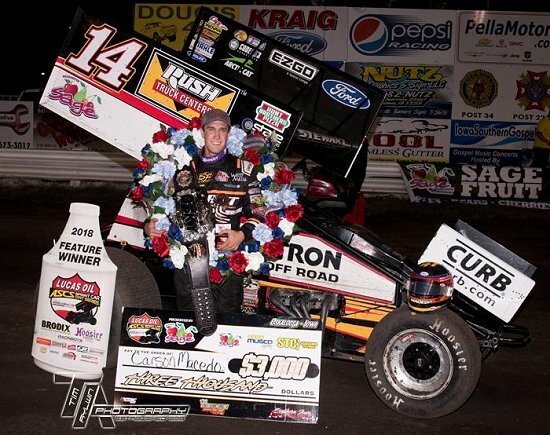 Let's just go back to what we know and that's what we did tonight, and the track came around exactly like I thought it would," said Sam, who picked up his 36th career win with the Lucas Oil American Sprint Car Series presented by Sawblade.com. Asked what the key to getting the lead, Sam stated, "It didn't really matter, we were so good that he could lead into one, and we were still going to lead off two. We had a really good race car and having a car that was that good, even if the start doesn't go your way, you just wait a half-lap and get it done." Working into traffic by Lap 7, the back markers didn't slow the Heidbreder Foundation No. 15h an inch, Wayne Johnson sat a distant second battling an ever-tightening race car, the Outlaw Wings No. 2c finally had a challenge for the runner-up spot on Lap 20 with Scott Bogucki working to the second podium step the following revolution. Hoping for a caution despite the myriad of lapped cars in the running order, the caution lights stayed dark as Sam rolled under the checkered flag 5.853 seconds ahead of Bogucki's Sawblade.com No. 28. Wayne Johnson held for his 158th career podium finish. Blake Hahn making the most of provisional to claiming from 23rd to ninth. Carson Short rounded out the top-ten. With the Hockett/McMillin Memorial in the books, teams will gear up for the final run to the 2018 Championship as four nights remain. Things fire off again on Friday, October 19 and Saturday, October 20 with the 45th Devil's Bowl Winter Nationals in Mesquite, Texas followed by the Creek County Speedway Fall Fling on Friday, October 26 and Saturday, October 27 in Sapulpa, Okla.
Bryan Hulbert - WHEATLAND, Mo. (September 21, 2018) Four leaders over the course of 25 laps, and the one leading the most important lap on Friday night was Johnny Herrera. Snapping an 80-race winless streak, the Mesilla Valley Transportation No. 45x was masterful on the high-line en-route to his preliminary night win in the Hockett/McMillin Memorial at Lucas Oil Speedway. "We needed this win. I'm pretty sure it's been over a year since we won one of these things. We've been close all year, and just couldn't get it done. We've changed cars, bars, just about everything but it all came together tonight," commented Herrera. Johnny's third career win at Lucas Oil Speedway, the 2013 Hockett/McMillin Memorial Champion will take the green from the third starting spot in Saturday's $10,000 to win A-Feature. "We've been good here, but not great so we'll keep working at it for tomorrow and see if we can get another one." Chasing Wayne Johnson and Matt Covington on the start, Johnny slipped to fourth as the No. 47x of Dylan Westbrook snuck by for third right as Matt Covington took over the race lead on Lap 4 by 0.001 seconds over Wayne Johnson. Contending with Westbrook, the Ohsweken Speedway No. 47x grabbed the runner-up spot only to have the red for Roger Crockett bring the race back to Lap 5. Keeping pace over the field on the restart, Covington kept a 10-car length advantage over the race for second as Johnson, Westbrook, and Herrera began battling with the caution coming out working Lap 10 as Westbrook went around in turn two. Moving Johnny to third, the New Mexico shoe went to work on Wayne for second with the high line pass coming on Lap 12. Chasing from the fifth starting spot, Jake Bubak paced patiently around the bottom in the Howard Law No. 9x. Moving to third on Lap 13, Bubak shot past Herrera on Lap 14 and took over the lead from Matt Covington one lap later. Maintaining his pace around the hub of the three-eights oval, Bubak held onto the race lead until Lap 18. With his run building on the cushion, Herrera made the race-winning pass the following lap. Opening his advantage to 1.020 seconds at the drop of the checkered flag, it was Tony Bruce, Jr. from the 13th starting spot who advanced to claim runner-up honors in the Tiger Towing No. 86, with the pass on Bubak on Lap 23. Jake would settle for third with Matt Covington and Wayne Johnson slipping to complete the top-five. With a win and a fifth-place finish on the weekend, Wayne Johnson will lead Saturday's $10,000 to win A-Feature to the green. Rolling up from 10th, Sam Hafertepe, Jr. crossed sixth and will start to the outside of the front row on Saturday night. Rebounding from a provisional on Thursday night, Seth Bergman moved from 11th to seventh. Advancing out of a B-Feature, Derek Hagar was the night's CP-Carrillo Hard Charger; moving ahead 12 positions to eighth. Blake Hahn finished ninth with Jack Dover making up the top-ten. The 8th annual Hockett/McMillin Memorial concludes on Saturday, September 22 with the action going green at 6:35 P.M. (CT). In overall event points, the top-eight drivers locked into Saturday's finale is Wayne Johnson (312), Sam Hafertepe, Jr. (299), Johnny Herrera (290), Tony Bruce, Jr. (271), Matt Covington (269), Scott Bogucki (263), Derek Hagar (261), and Dylan Westbrook (259). The remainder of the field will drop into four Last Chance Qualifiers, going 10 laps, taking the Top 2 from each into the A-Feature. After that, drivers that don't transfer will go into B-Feature action. Bryan Hulbert - ELDON, Mo. 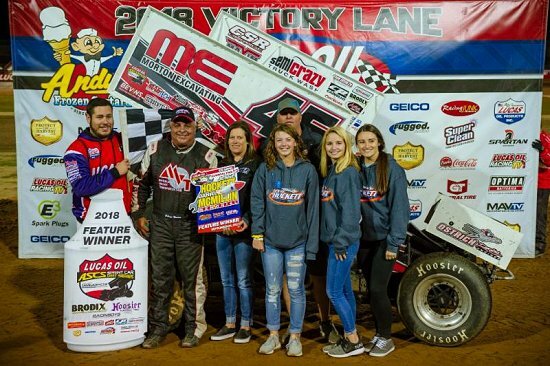 (September 2, 2018) Leading every lap in Saturday's 41 lap Feature Event, Sammy Swindell completed the weekend sweep of the Lake Ozark Speedway 360 Nationals presented by Impact Signs, Awnings, and Wraps with the Lucas Oil American Sprint Car Series presented by Sawblade.com. Collecting a cool $10,000 for his 20th career victory with the Lucas Oil American Sprint Car Series presented by Sawblade.com, Swindell again raced across the finish line with a near half-track advantage in the A.G. Rains owned No. 3s. "The track was a bit different tonight. We just made a couple small changes from what we didn't like the other night and the car was actually better than it was last night," stated the wily veteran. "Once I got to lapped cars, it was a little bit tough. They were running pretty hard and running two and three deep when we'd catch them but this thing would go anywhere I wanted to go so I could go where they weren't. I was just trying to save the car and save the tires as long as I could, and when we got to 10 go, I just let it eat." Beating out Kyle Bellm on the opening lap with Derek Hagar following to second, the caution lights blinked on with two laps complete as Tyler Utz rolled to a stop just off the edge of the track entering turn three. Pulling the No. 9jr on the restart, Sammy's progress was slowed again with 17 laps to run as Paul Nienhiser snagged the berm, in turn, four, snapping his No, 9x around. Restarting with a gaggle of lapped cars in the mix, Hagar picked off half the slower crowd before the caution flew again on Lap 31 for Kyle Bellm. With four lapped cars running between Swindell and Hagar, the battle was working through the field as Brian Brown began rallying through the lineup with Seth Bergman in tow. Also having to contend with the myriad of lapped traffic, Brown had the wing in the truck as he closed on Hagar with less than five laps to go. Both still not able to make up any ground on Swindell, the CP-Carrillo No. 3s collected his fifth Lucas Oil American Sprint Car Series presented by Sawblade.com victory of the season. Derek Hagar held on for runner-up honors with Brian Brown rolling to third from eighth. Seth Bergman in fourth made up more ground in the chase for the championship with the Corridor Electric No. 23 now only 16 points away from the lead. The top-five wrapped up with Jonathan Cornell. Nearly getting tipped on the opening lap, Sam Hafertepe, Jr fell back to nearly 15th before rallying back to sixth in the Hills racing No. 15h. Travis Rilat in seventh was followed by Tyler Thomas with Wayne Johnson and Jamie Ball completing the top-ten. Putting up extra money for the Hard Charger, Johnny Herrera advanced eight positions and for that, collected $500 from Searsboro Telephone, Co. plus another $125 from Schure Built Suspension. Heat Races numbered six with wins going to Wayne Johnson, Seth Bergman, Tim Crawley, Scott Bogucki, Jamie Ball, and Johnny Herrera. Qualifiers were topped by Matt Covington, Sam Hafertepe, Jr,, and Brian Brown. A trio of B-Features were topped by Blake Hahn, Tim Crawley, and Sean McClelland. Another five-figure payday awaits the Lucas Oil American Sprint Car Series presented by Sawblade.com in the "Show Me State" as the Jesse Hockett/Daniel McMillin Memorial is set for September 20, 21, and 22 at Lucas Oil Speedway in Wheatland, Mo. Tickets for the three-night affair are on sale at http://www.lucasoilspeedway.com. Bryan Hulbert - ELDON, Mo. 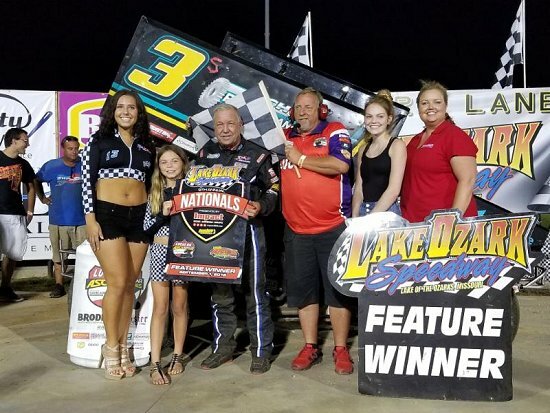 (September 1, 2018) Sammy Swindell is still winning; dominating by a half-track to open the Lake Ozark Speedway 360 Nationals presented by Impact Signs, Awnings, and Wraps with the Lucas Oil American Sprint Car Series presented by Sawblade.com on Saturday night. "My car was really good in the Qualifier, and we were able to pull away quite a bit in just a couple laps. We made a couple changes for the Feature, and we were probably a little too tight to start. I ran the top and one and two and it was really good so I ran the top of three and four and it wasn't so that let Sam [Hafertepe] get by, but I could tell we had them covered and it was just a matter of time," commented Swindell on his seventh overall win of the season. "I think these ASCS races, our average is like a second or third. That's hard to beat, and you know we've had some breaks on some of this stuff, but we've been getting our car working better all year too so we'll just work to stay ahead of everybody else." Chasing the No. 15h as the back of the filed came into play, Hafertepe's night ended abruptly as the Hills Racing entry rolled to a stop atop the first turn with a fueling issue working Lap 7. Taking over the runner-up spot on Lap 21, Derek Hagar made up very little ground on Swindell before the checkered flag flew. Following the No. 9jr, Kyle Bellm ended his night third with Tyler Thomas holding onto the final transfer into Saturday's $10,000 to win A-Feature. Rolling up from 10th, Washington's Seth Bergman completed the top-five. With the DNF by Hafertepe, the point's battle is back under a blanket with Bergman closing the gap to 24 points with Blake Hahn lurking in third with a 59-point gap to make up. Earning the night's CP-Carrillo Hard Charger Award, Sean McClelland never vacated the low line in the D&E Supply No. 22s, advancing 14 positions to finish sixth. Randy Martin in seventh was followed by Wayne Johnson, Johnny Herrera, and Paul Nienhiser to round out the top-ten. Bryan Hulbert - OSKALOOSA, Iowa (August 7, 2018) Carson Macedo is having a dream week in Iowa. Working the low line of the Southern Iowa Speedway, Oklahoma's Blake Hahn steadily made his way from 13th to fourth. Picking up five positions, Washington's Trey Starks made up the top-five. With the 5-hour ENERGY Knoxville Nationals presented by Casey's General Store firing off on Wednesday night, the next event for the Lucas Oil American Sprint Car Series presented by www.Sawblade.com will be Saturday, August 18 at Hamilton County Speedway in Webster City, Iowa and Sunday, August 19 at Missouri State Fair Speedway in Sedalia, Mo. For other news, notes, and information on the American Sprint Car Series, from the National Tour to any of the Regional Tours that make up the nearly 150 races across the ASCS Nation in 2018, log onto www.ascsracing.com, follow on Facebook, on Instagram, and on Twitter (@LucasOilASCS).